Most of us shop for shoes based on size charts, but individuals with wide feet understand the struggles of stuffing their feet into shoes that are the right size alright, but are far too tight to snugly fit. 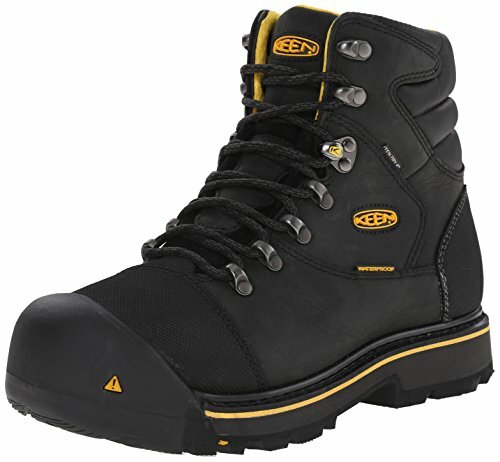 When it comes to safety boots, the proper fit is all the more imperative to ensure you’re comfortable on your feet and on the go, protected not just by features like metatarsal guards and toe caps but also a wider fit to properly cradle your feet without having to opt for something a couple of sizes up (and risk your heel slipping about and crushing your toes). Improperly fitting shoes can cause all sorts of problems from painful blisters that make keeping boots on absolute hell, especially when you’re at work and can’t just throw your footwear off, to bunions and plantar fasciitis. However, thankfully, if you know what you’re looking for, you can find the perfect pair of safety boots for wider feet. Available in widths from medium to extra wide, these safety boots package high-functioning protective features, rugged and durable build and comfort all in one pair. The 90-degree heel gives you the perfect grip for climbing and standing on ladders safely to give you the additional traction on the rungs, rugged oil and slip resistant outsole letting you safely navigate rough, wet and uneven terrains with ease. Left and right asymmetrical steel toes offer up a roomy toe box for greater comfort without compromising on safety. The shoes meet or exceed ASTM F2412-11 and F2413-11 I/75 C/75 EH standards, which covers impact and compression resistance and electrical hazard protection. Available in widths medium to wide, the attractive lace-up, tonal-stitched leather exterior camouflages some highly functioning protective features. Nylon shock diffusion plates offer excellent impact resistance ideal when your work involves a lot of heavy lifting or climbing up and down tricky areas, patented Timberland PRO rubber outsoles oil and slip resistant to give you the appropriate traction and stability in uneven or wet conditions as well as offering a good measure of puncture and heat resistance. Steel safety toes meet ASTM F2412-11 and F2413-11 safety standards for impact and compression resistance. 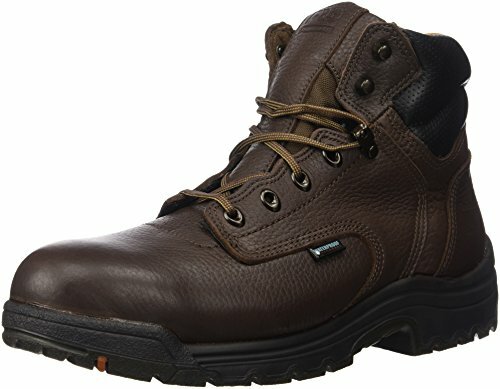 As well as keeping you safe, these boots also keep you comfortable, with the trademark Timberland PRO 24/7 Comfort Suspension system offering appropriate arch support and stability, while the removable open-cell PU footbeds, treated to be anti-microbial and odor-resistant, cradle your feet and keep you comfy through long work days. Padded top collars and Cambrelle fabric linings enhance this comfort, the boots designed to be ready to wear straight out of the box, forgoing the excruciating breaking in period. The perfect choice of boots for wet and slippery conditions, these rugged heavy-duty boots are available from medium to extra wide for the cosiest fit. The pair features a water impermeable membrane to up the ante in the water-resistance department, to keep moisture out of your shoes and your feet dry. The leather upper of the boots is treated to be waterproof, to prevent moisture damage. The trademark Titan alloy safety toe caps are lightweight and asymmetrical, meeting ASTM F2412-11 and ASTM F2413-11 safety standards for impact and compression resistance as well as meeting the safety standards for electrical hazard protection overall, ideal when handling or repairing electrical components or navigating an area with them. Safety specs are further enhanced by the oil and slip resistant Timberland PRO rubber outsoles for extra stability and traction. Meanwhile, the nylon shock diffusing shank gives the boots and you the extra stability and support needed to maintain the natural curvature of your feet and reduce strains from impact when handling heavy equipment or during activities like climbing on and off of ramps and high vehicles, while a molded PU midsole and contoured open cell PU footbeds cushion your feet while holding up and supporting their natural curves, preventing the likelihood of sore feet, blisters and painful damaged tissue conditions like plantar fasciitis. Additional comfort-ensuring features include a moisture-wicking and breathing inner mesh lining engineered for odor control and anti-microbial treatment. 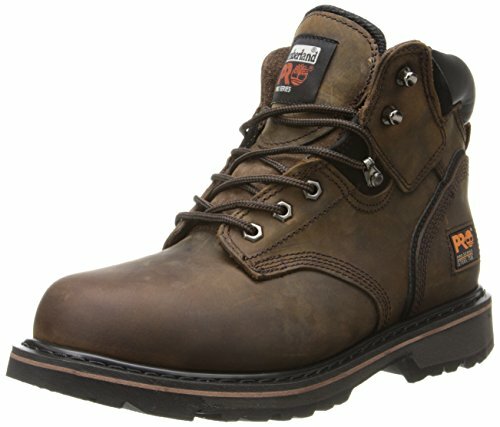 Available in medium to extra wide, these attractive boots feature protective steel toe caps rated safe in terms of impact and compression resistance as well as being effective protection against electrical hazards. 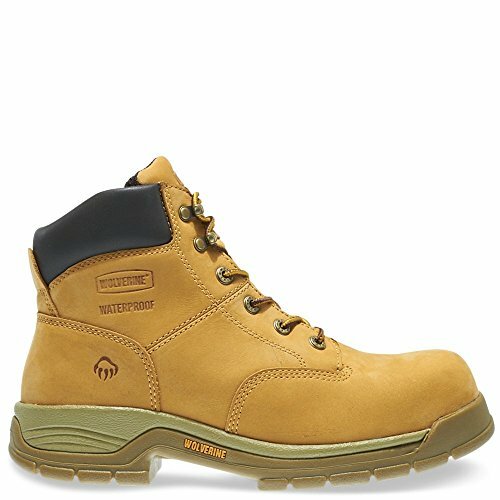 The attractive wheat-colored nubuck leather upper is water resistant, while the single density PU midsole and removable contoured footbed support your arch and keep you comfy through long work days. A lightweight nylon shank provides support and stability, holding up the natural curvature of your feet and preventing shocks and bumps from causing sprains and aches. A PK mesh lining keeps your boots breathable and comfy while resisting bacteria and odors. Slip resistant, rugged outsoles give you the grip you need on uneven and wet terrains, water and abrasion proof for durability and good puncture resistance.